I used to be kinda opposed to Hot Spinach Artichoke Dip, just on principle…and here’s the deal: Back in the ’80s, it was all about the creamy Spinach Dip and it was served warm or cold in a bread bowl. I loved that stuff! And I remember how fancy we all thought it was, too. Then in the ’90s it was all about the Hot Artichoke Dip. It seemed that just about every restaurant had a version. It was everywhere! And I loved that stuff, too! Of course, I’ve always had a thing for artichokes, and guess who else in the house does? Homer, my cat. She goes nuts over them. She can smell even the canned artichokes in the grocery bag and immediately comes running! Then Olive Garden came onto to the scene and served the Hot Spinach Artichoke Dip. (And goodness help me, here I am posting another recipe based off the OG – I just made their Zuppa Toscana the other day. Usually, I try to shake things up, but it’s another one of my drafts I’ve been going through since I injured myself!) I always thought Olive Garden came up with the combo specifically coz it was so much cheaper to add spinach to that pricier but oh so tasty artichoke dip. So I kind of got on a high horse about it and turned up my nose. When I got around to trying Hot Artichoke Dip, I thought it was just pretty good. I liked it but didn’t think it really delivered on flavor. I wanted more! And this dip has it! So this Hot Spinach Artichoke Dip isn’t an Olive Garden “Copycat.” It’s bigger, it’s better, it’s cheesier and it delivers big time on flavor. Lots of Italian flavor. I love using my homemade Italian Seasoning Blend, but any good Italian Seasoning is just fine, too. And while this Hot Spinach Artichoke Dip is not hot at all, zesty might be a good word to describe it. And I suppose this might be a good time to mention that the word “dip” is kind of loosely given for any of the Hot Spinach Artichoke Dips. It’s really more of a “spread” because they’re so rich and thick. I love love love the texture of this Hot Spinach Artichoke Dip. A combo of sour cream & mayo keeps it creamier than most and a little less prone to be too oily. I like to use a little mozzarella because it’s so melty and creamy, then some provolone because I think it has a bit more flavor than the mozz. And I ditch the Parmesan and/or Romano in favor of Asiago. They’re both about the same price, and sometimes Asiago is a little less which is always a bonus, but I think it’s a little more assertive, a little less “buttery.” I think you’ll like this combo, but nothing’s ever set in stone, so if you don’t have all these cheeses or don’t like all these cheeses, use what you’d like. It’s all good as they say! If I have some on hand, I don’t mind adding a drop or two of white wine to the dip. Just a little, two tablespoons or so. 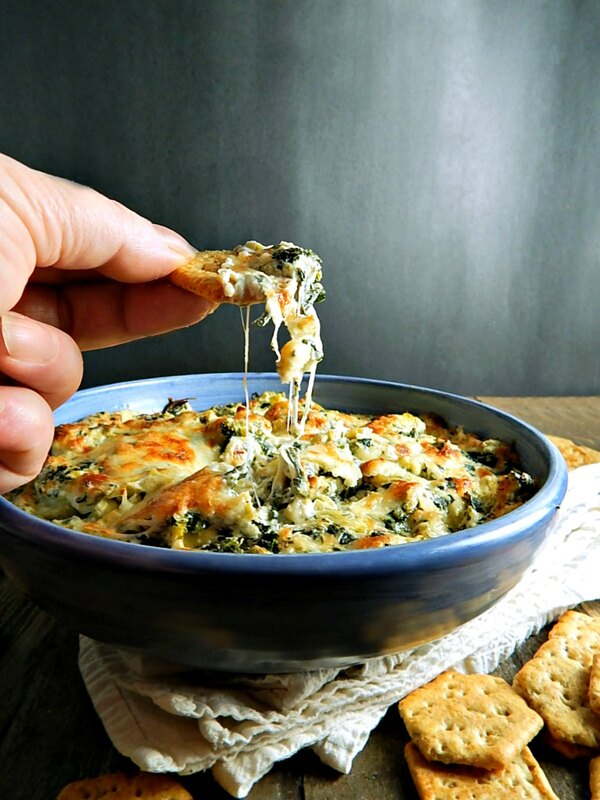 Serve your Hot Spinach Artichoke Dip with crostini or bread or pita chips or just any old crackers you have on hand. You couldn’t go wrong with those little crunchy breadsticks, grissini, either. Or maybe you want to serve just part of your Hot Spinach Artichoke dip and hold a bit back to spread on a sandwich (I have one coming up) or stuff chicken breast. Or maybe you might want to just stuff shells or make manicotti. The possibilities are almost endless. When you make Hot Spinach Artichoke Dip make sure your cream cheese is room temperature and really soft; if it isn’t pop it in the microwave for 30 seconds or so. I like to mix all the spices into the cream cheese first and it’s not difficult to do it by hand. If you have your mixer handy, it makes really short work of it. If you don’t have your mixer handy or it’s a deal to get to it, don’t bother with it. Then it’s just a matter of using some muscle!. Just don’t forget to save a little mozzarella for the top, which you’ll add towards the end of the baking. What really makes a big difference in the dip is the draining of the artichokes and getting the moisture out of the spinach. You want to drain the artichokes well, preferably in a strainer. If they’re whole, cut them first, then when the excess moisture is out, chop them. Don’t go too fine because it’s nice to have a few chunks here or there. The spinach will make or break this dip. Honestly, frozen works best. Thaw it out ahead in the fridge if you can overnight at least, but put the package on a plate in case it leaks. Then put your spinach in a thin towel, one you won’t care if it stains, and roll it up. Take both ends and twist and twist, getting as much moisture out as you can. You’ll end up with about 3/4’s of a cup. Lay it out on a cutting board and chop through it. It’s a bit like chopping styrofoam but keep at it, going across it in one direction with your knife and then going at a right angle until it’s broken up into little bits. No one wants strings of spinach in their dip or large unattractive stems! I always check quick sale/marked down bin or shelves in the store for artichoke hearts and pick them up if I see them. Sometimes I find them on sale in the regular aisle but they’re generally not advertised in my fliers. Check to see if the quarters are less than the whole and if there are off-brand artichokes they’ll be just fine in this dip. If you want to go a little more high end, the marinated artichokes are really good in this dip. Frozen spinach is usually less in the fall and the price rises throughout the winter. Stock up if you see it at a low. As for the cheeses, stock up on those when you see them on special at the store. The mozzarella and provolone are basic grocery store cheese and will keep for weeks unopened and may be frozen, although the texture will be more crumbly. Watch for hangtags (coupons hanging in the cheese section) or coupons on the producer’s website for the Asiago or Parmesan or Romano if using. These “near deli” cheeses sometimes go on sale buy one, get one 50 percent off and it can be very worthwhile to use two $1.00 coupons. Cream cheese keeps for weeks and weeks so buy it on special and watch for sales almost any holiday. Chuck it in the fridge and use as needed. It can be frozen as well, but it’s not ideal. In my area, the regular price can be as high as $3.49 a pack while the low sale price is $1.25. In a bowl combine cream cheese and spices, seasonings & herbs. Mix thoroughly. Add in the sour cream and mayonnaise along with the wine if using, stirring thoroughly. Stir in the cheeses, spinach and artichokes with a heavy spatula, mixing thoroughly from the bottom up. Place into a small casserole and bake for about 20 minutes. Add the remaining mozzarella on top and bake about 10 more minutes until bubbly and the cheese is browning in spots. Bake 25-30 minutes or until bubbly and cheese is browned. If cheese isn’t browned enough turn on the broiler for a few minutes, watching carefully. Note: may use two small cloves of garlic or one large, finely minced or put through a press instead of the garlic powder; there will be a bit of a raw garlic taste in the dip. If desired, this can be served from a crockpot instead of baked. Heat on low until warm, preferably in a small slow cooker, one to two hours. I’ll be sharing my Hot Spinach Artichoke Dip at Fiesta Friday #252, and the co-hosts this week are Alex @ Turks Who Eat and Zeba @ Food For The Soul. Stop by and check out Fiesta Friday and Alex and Zeba’s sites; you’ll love them all! This entry was posted in Click here for Fabulous Food Posts and tagged Alcohol, Appetizer, Artichokes, asiago cheese, Cheese, Cream Cheese, Mozzarella, parmesan, provolone, Spinach. Bookmark the permalink. Delicious! Always a crowd pleaser. Thanks for sharing! Thanks! Is it bad to say it’s my favorite way to eat spinach, lol? I share your love of artichokes Mollie – this one is a keeper that I’ll try over the Christmas holidays! I don’t think you’ll be disspointed! I love artichoke spinach dip. Thanks! I love artichoke spinach dip. Surprisingly, the first place I tried it (and loved it) was at a T.G.I.Fridays. Now I kind of want some now. Hi Britt! Now that’s a blast from the past and probably predates Olive Garden, I bet! I just had to check and it turns out the twin cities has a bunch of TGI Fridays. I remember them as being one of the first big chains (that I knew about anyway) along with Bennigans. Thanks! It really is good and perfect for the upcoming holidays or New Year’s. Yum! Hot dip, plus it is keto friendly as long as I dip cukes or celery! You’re right it is! It would be good with carrots, too, athough II think they’re have too much sugar to me properly keto. That’s a fine looking Hot Spinach Artichoke Dip. I remember those spinach dip sourdough bread days. I always prefer my spinach and artichoke dips warm but haven’t had any for some time. I’ll just save this one for our upcoming Little Christmas Eve party. I bet your friends and neighbors there just love you and you must be sharing all kinds of foods with them! Mollie they do, we live next to a complex that houses 16 special needs adults, most of them suffer down syndrome or autism and they are the best neighbors ever. So they get lots of goodies. Oh wow, bless your heart Ron! It’s so nice of you to think of them and I’m sure that brightens their day!